It always feels like a minor miracle whenever Hollywood adapts a children's book into a movie and just nails it -- the look, the tone, the characters, the lack of condescension. And "The Spiderwick Chronicles" nails it beautifully. 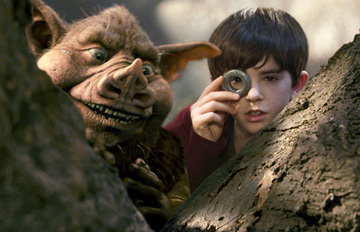 It probably helped that "Spiderwick" authors Tony DiTerlizzi and Holly Black acted as executive producers on the film, and worked closely with a top-notch filmmaking team that includes director Mark Waters, screenwriter John Sayles, cinematographer Caleb Deschanel, Spielberg's editor Michael Kahn, and creature-animation deity Phil Tippett. This is more or less a dream team -- and together, they do a mostly stunning job telling the story of a broken family (Mary-Louise Parker, Sarah Bolger and Freddie Highmore in dual roles) who slowly realize their rural mansion is under siege by invisible monsters led by a terrifying ogre (Nick Nolte). "Spiderwick" is fun, smart, well-acted, gorgeous to behold and surprisingly intense toward the end, when the story sort of turns into Helm's Deep for Kids. (It would be nice if the film featured less of James Horner's overbearing score, which wants to do all your feeling for you, but that's quibbling.) The film's myriad magical beasties look like they lumbered out of a storybook, and a couple of them represent some of the finest creature animation I've ever seen. But best of all, Waters and his team remember to make the movie about human beings; like "E.T.," this is a story about dealing with absent fathers that happens to be filled with adventure and outlandish critters. B-plus; 97 minutes, rated PG for scary creature action and violence, peril and some thematic elements.